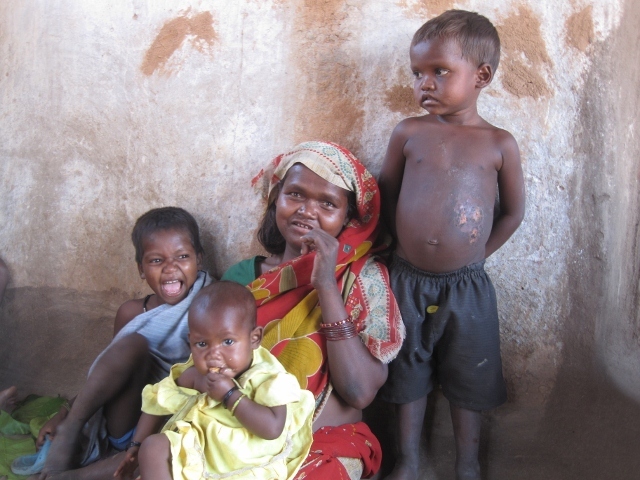 Primitive Tribal Groups (PTGs) living in Chattisgarh, India, struggle to provide for their families and are forced to lie about their identity to overcome the sterilisation restriction owing to a three decade old order of the Madhya Pradesh government that restricted PTGs from being targeted during the sterilisation drives of the time. Sarguja: A three decade-old Madhya Pradesh government order has several adivasi families in Chattisgarh in a quandary. They struggle to provide for themselves but are turned away by government officials if they try to restrict their family size. “I do not want more children but the ‘mitanin’ (village health worker) says she cannot take me or anyone from my community to the clinic for an operation,” says Phool Sundari Pahari Korva from Jhamjhor village, located in the forests of Sarguja district in north Chhattisgarh. She has five children – her oldest is 18 and the youngest, a daughter, is six months. All of Sundari’s four younger children have frail limbs and bellies swollen by malnutrition; the skin on her younger son’s chest has peeled off due to an infection. The reason that Phool Sundari, a Pahari Korva adivasi, was denied sterilisation at a local government clinic: A 1970s order of the Madhya Pradesh (MP) government that restricted Pahari, or Hill, Korvas and four other Primitive Tribal Groups (PTGs) living in Chattisgarh from being targeted during the sterilisation drives of the time. The original intent was to protect the PTGs, a term recently amended to Particularly Vulnerable Tribal Groups, from ‘extinction’. The PTGs were adivasi groups dependent on pre-agricultural technologies that had stagnant or declining populations. But 30 years on, the Chhattisgarh government has continued to enforce this anachronistic order adding to the economic burden of these families. Sabutri Bai, Sundari’s neighbour, recounts that she got sterilisation done after giving birth to her sixth child three years back but was surprised at what followed. “When the staff at the Lakhanpur clinic found out I am a Pahari Korva, they were going to dismiss the nurse who allowed me to get operated,” she says. “It makes no sense. We have 1.5 acres land. How do they expect us to provide for more and more children?” asks her husband, Phool Chand Ram, who used to work under the rural employment guarantee act, MNREGA, two years back but gave it up when he got wages only a year later. Their eight-member family survives by selling firewood, earning Rs 100 (US$1=Rs 55) for every two-day trip they make into the depleting forest. Over 50 kilometres away, in the villages of Batauli block, the situation is similar. Pahari Korvas struggle to provide for their families and are forced to lie about their identity to overcome the sterilisation restriction. “I stopped producing nursing milk after I gave birth to my fourth child. I could only give my babies rice-water. When I wanted to get the operation done, the malaria link worker (a government health worker) said I should give my caste as Majhwar or else the Shantipada hospital would not do it,” says Mangli Bai Korva of Govindpur village. The original order, passed on December 13, 1979, identifies PTGs, including Pahari Korvas, Baigas, Abujhmaria, Birhor and Kamar tribes, in 26 blocks in MP to be excluded from sterilisation but allows them access to contraceptives. “You have been given district-wise targets for sterilisation. An exception should be made for tribal communities whose population is stagnant or decreasing… they should have access to other contraceptives if they require. …Everyone except these communities will be encouraged to get sterilised…,” reads the two-page order. Adivasi families in Sarguja, however, say they have never heard of temporary or permanent contraceptive methods such as birth control pills, condoms, or the copper-T, an intrauterine device. Further, while the order permits PTG families to go in for sterilisations after procuring a certificate from the Block Development Officer, neither health workers nor tribals are aware of this provision and most have no direct access to block officials. Sarguja has over 4,500 Pahari Korva families. Since 1996, they have been the focus of several development schemes, which promote agriculture, animal husbandry and horticulture, executed through the Pahari Korva Development Agency. But despite good intentions and adequate resources – last year, the agency had a budget of Rs 3.72 crore – district officials admit not much has changed. “Schemes do not get implemented properly because there is little coordination among various departments. We are now trying to involve the Pahari Korva Mahapanchayat in planning the use of funds,” says R. Prasanna, the District Collector. “Maybe if the Mahapanchayat made a collective appeal, the government will reconsider the sterilisation order,” he adds. In the three decades since the order has been in force, the PTG population has increased but their access to health and nutrition has stayed as uncertain as ever and it is this fact that is central to the debate over the restriction. National Family Health Survey-3 data shows that compared to the national average of 46 per cent of underweight children, 70 per cent children born in PTG families are underweight. Malaria and diarrhoea epidemics are frequent every monsoon. In the instance of Pahari Korvas, the Infant Mortality Rate (IMR) is 166 deaths per 1000 live births, more than double the national average, says a 2007 study by researcher Sandeep Sharma. The study also records the crude death rate as well as birth rate among these adivasis – more children are born, but many more die. So, is the government hiding dismal malnutrition and high mortality numbers with a sterilisation ban? “Independent surveys show the government undercounts the level of malnutrition. For three years between 2007 and 2010 the state reported zero deaths from malaria and diarrhoea to the central Ministry for Health and Family Welfare,” says Sulakshana Nandi, a public health activist based in Raipur. “Block and district clinics in Raipur and Mahasamund were out of stock of contraceptives when we visited this January. PTGs are in a bind because they neither get adequate nutrition nor access to contraceptives,” she adds. The ban has been a matter of public debate in the state since an investigation by journalists in Kawardha district last year traced how dalals (middlemen) from MP were luring Baiga tribals across the border for sterilisation for Rs 1,000, ironically as part of MP government’s continued sterilisation drives. Since then PTG communities such as Kamars in Gariaband district and the Baigas in Kawardha have organised public meetings demanding that the government remove the ban and focus instead on improving access to public services. “Baigas want to restrict their family size for their well-being, not because of Rs 200-300 that we could earn as incentive for sterilisation in clinics in MP,” asserted Bhaigla Singh Baiga, a community leader while addressing the Baiga Mahapanchayat meeting in Taregaon in May 2012. Government officials have taken notice of these demands. “I agree that the demographic situation has changed and that informed choice should be available to everyone. It is, however, incorrect to blame high mortality on the failure of state services; ‘anganwadis’ can provide only supplementary nutrition, substantive nutrition has to come from the household,” says Kamalpreet Singh Dhillon, Director-Health Services in Raipur. But nutritious food continues to be elusive for the Pahari Korvas living deep inside the Mainpat and Khirkhiri hills who wait for both their right to food and their freedom to decide family size. Following the publication of this report, Planning Commission sent a directive to the Chhattisgarh government to issue clarifications to ensure that PTGs may not be denied sterilisation facilities. A follow-up report published by Alok Gupta in Down to Earth with data on PTGs population in Chhattisgarh on November 8 here.